The Oracle Cloud Managed Services Provider Summit 2018 recognises the best-in-class Oracle EMEA Cloud Managed Services Providers at the forefront of deploying Oracle Cloud solutions to solve business problems, and to help customers realise maximum value from their Oracle Cloud investments on a continuous basis. The prestigious Oracle Partner Network event took place on the 22nd of March in Amsterdam to honor best-in-class Oracle partners pioneering Oracle Cloud Managed Services for their customers within the EMEA region. 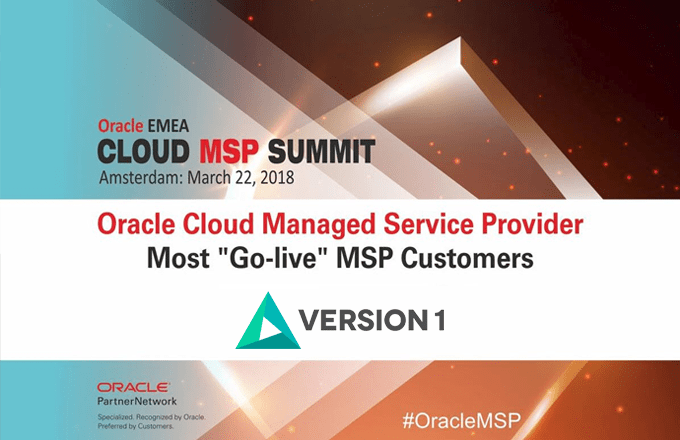 Version 1 is delighted to have been recognised by Oracle as the Cloud Managed Services Partner with the Most Go-Live MSP Customers. We offer the full range of cloud services for enterprise applications. Version 1 has experience of working with customers at all stages of their cloud journey to enable them to maximise business outcomes through cloud. We provide independent expertise as to how customers can gain the best value from cloud and software providers. We work with customers to identify business objectives and key performance indicators to ensure that these can be tracked in the cloud. This includes how to consider new services, how to forecast cloud usage and how to measure cloud consumption.